When Will This Tyrant Be Overthrown? The campaign to save Alfie Dingley’s life looked to have succeeded on 20th March when 108 MPs met Alfie and family at Parliament. 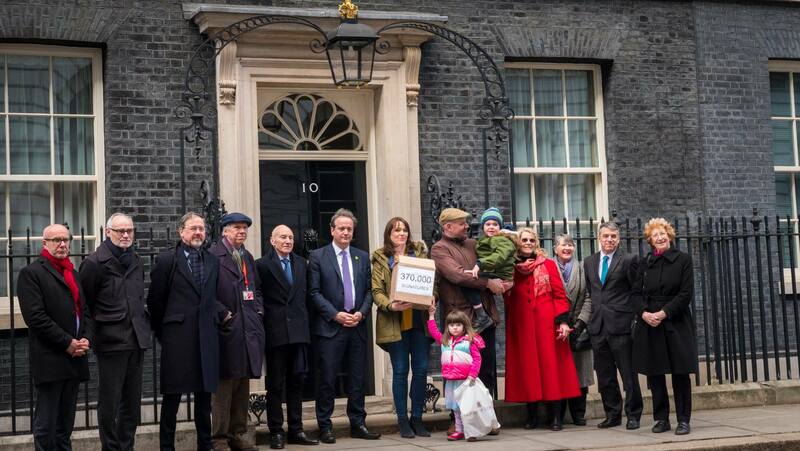 That same day, accompanied by Sir Patrick Stewart, a petition of over 370,000 signatures was delivered to Downing Street and Theresa May herself met with the family and encouraged them that everything possible would be done to help. Originally, the Home Office were suggesting that they might issue a licence to allow a bespoke trial of medical cannabis but that changed to a suggestion that they would consider issuing a licence on a ‘compassionate basis’. They also indicated that they might issue the licence for Alfie within days rather than weeks. Home Office Minister Nick Hurd MP appears to support the petition delivered to Downing Street. Today (3rd May 2016) the petition has gown to over 650,000 signatures. A formal application for a licence was submitted to the Home Office on 16th April 2018 by Alfie’s GP and a consultant neurologist. This was raised at Prime Minister’s Questions two days later and once again Mrs May expressed sympathy and promised that the Home Office would look at it “speedily”. Now, Hannah, Alfie’s mother, has been told that it could take up to four months for the application to be considered and even then no one can be certain what the decision will be. Apparently this is because the medical cannabis oil needs to be ‘tested’, whatever that means. Is this a U turn to requiring a full clinical trial to be undertaken? If so, how can a clinical trial be undertaken on one boy with a particular form of epilepsy so rare that he is said to be one of only nine boys in the world? Clearly a clinical trial with the normal double blind testing is impossible. So what other form of ‘testing’ needs to be carried out? The oil has already been tested on Alfie under the supervision of a consultant neurologist in the Netherlands. There, having experienced up to 30 seizures per day in the UK, after taking three drops of oil per day he had only two seizures in two months. The oil is made by Bedrocan, the Netherlands government official contractor for the production of cannabis for medical use and already complies with international standards for Good Manufacturing Practice (GMP). The only conclusion that can be drawn is that this is yet more procrastination and deliberate delay by a government that is notorious for its inhumane treatment of many people. Theresa May has a long standing and well documented record of being opposed to any drug law reform and of dismissing the campaign for access to cannabis for medical use as ‘just an excuse to take cannabis’. With the sole exception of President Duterte of the Philippines, who is engaged in a murderous campaign of extra-judicial execution of suspected drug dealers, Mrs May is the only world leader still calling for the ‘war on drugs’ to continue. After scandal after scandal after scandal it is difficult to see what will finally bring Mrs May down. In Britain, where the idea of democracy has become little more than a bad joke, it seems that infighting within the Conservative Party over Europe is a more likely reason for her downfall than the grave abuses of individuals for which she is ultimately responsible. Let’s be 100% clear, the Misuse of Drugs Act 1971 makes specific provision for any action that would otherwise be unlawful under the Act to be permitted under licence by the Home Secretary. It would take a single stroke of Sajid Javid’s pen to save Alfie Dingley’s life and Theresa May could have ordered that months ago. Famously, Mrs May is a practising Christian. Surely, there must be a special place in hell reserved for her. read what looked at face value to be a positive resultin a campaign update. in fact I articulated my thoughts, feeling absolutely horrible having to do so because i HATE being right in such cases.Teresa May, it seams , has about as much compassion as a lump of inert material. there are four beneficiaries in the current situation with regard to cannabis. namely, Teresa may, her husband, the MD of British sugar, and his wife ( can’t think of the names off the to of my head, sorry. ), it would not surprise me in the least to discover they where colluding with each other to cream off the profits from the cultivation, marketing, and distribution of cannabis products worldwide to the exclusion of UK citizens. It doesn’t teed to be tested, the evidence is there in abundance, unfortunately May and co are too hung up on their adherence to outdated policies to look beyond their noses. May is a heartless evil so-called Christian who should be charged with endangering the life of a minor, and if the worse comes to the worse(hopefully not). she should be charged with the murder of a minor. The lengths she will go too in protecting the pharmaceutical industry who presumably make considerable donations to the Conservatives is appalling. She needs to be reminded of the parable of the Good Samaritan, because she is not following in the footsteps of Jesus Christ. Theresa May, former Home Office minister albeit a useless one should tell the new HO minister to order the cannabis oil from the suppliers in netherlands and used for Alfie but she is a total procrastinator who goes back on promise after promise, that’s why she deserves the vilification that she is getting.